"Altan urag" redirects here. For the folk rock band, see Altan Urag. For the notion of having Genghis Khan as an ancestor, see Descent from Genghis Khan. A Borjigin (Mongolian: Боржигин, translit. Borjigin; ᠪᠣᠷᠵᠢᠭᠢᠨ; Russian: Борджигин, translit. Bordžigin; English plural: Borjigins or Borjigid; [Middle Mongolian plural? ]: [term? ], translit. Borǰigit;[a] [Manchu plural? ]: ) is a member of the sub-clan, which started with Yesugei (but the Secret History of the Mongols makes it go back to Yesugei's ancestor Bodonchar), of the Kiyat clan. Yesugei's descendants were thus said to be Kiyat-Borjigin. The senior Borjigid provided ruling princes for Mongolia and Inner Mongolia until the 20th century. The clan formed the ruling class among the Mongols and some other peoples of Central Asia and Eastern Europe. Today, the Borjigid are found in most of Mongolia, Inner Mongolia and Xinjiang, although genetic research has shown that descent from Genghis Khan is common in Central Asia. The patrilineage began with Blue-grey Wolf (Börte Chino) and Fallow Doe (Gua Maral). According to The Secret History of the Mongols, their 11th generation descendant Dobu Mergen's widow Alan Gua the Fair was impregnated by a ray of light. Her youngest son became the ancestor of the later Borjigid. He was Bodonchar Munkhag, who along with his brothers sired the entire Mongol nation. According to Rashid-al-Din Hamadani, many of the older Mongolian clans were founded by members of the Borjigin — Barlas, Urud, Manghud, Taichiut, Chonos, Kiyat, etc. 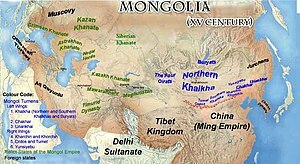 The first Khan of the Mongol was Bodonchar Munkhag's great-great-grandson Khaidu Khan. Khaidu's grandsons Khabul Khan and Ambaghai Khan (founder of the Taichiut clan) succeeded him. 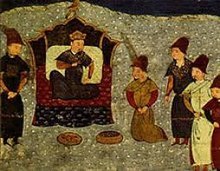 Thereafter, Khabul's sons, Hotula Khan and Yesugei, and Khabuls grandson Temujin (Genghis Khan, son of Yesugei) ruled the Khamag Mongol. By the unification of the Mongols in 1206, virtually all of Temujin's uncles and first cousins had died, and from then on only the descendants of Yesugei Baghatur, his brother Daritai, and nephew Onggur formed the Borjigid. According to Paul Pelliot and Louis Hambis, Rashid al-Din Hamadani once explained that "borčïqïn" designated "en turc" a man with dark-blue eyes ("اشهل ašhal"), and did so again without mentioning the said language, adding that Yesugei's children and the majority of their own children had had such eyes per coincidence, also recalling that the genie which had impregnated Alan Gua after her husband's death had had dark-blue eyes ("ašhal čašm"). Abu al-Ghazi Bahadur later paraphrased Hamadani by relating that Yesugei's eyes were dark-blue ("شهلا šahlā"), that the Mongols ("Moɣol") called such eyes "borǰïɣïn" (بورجغن), that his sons and most of their descendants had had dark-blue eyes ("ašhal"), and that one recognized thus in Yesugei's lineage the characteristic sign of the genie which had visited Alan Gua and had "borǰïɣïn" eyes, adding that the Arabs called "ašhal" a man whose iris ("bübäčik") was black, cornea white ("aq"), and "la ligne foncée circulaire qui entoure l'iris" red. Paul Pelliot and Louis Hambis have questioned these explanations. 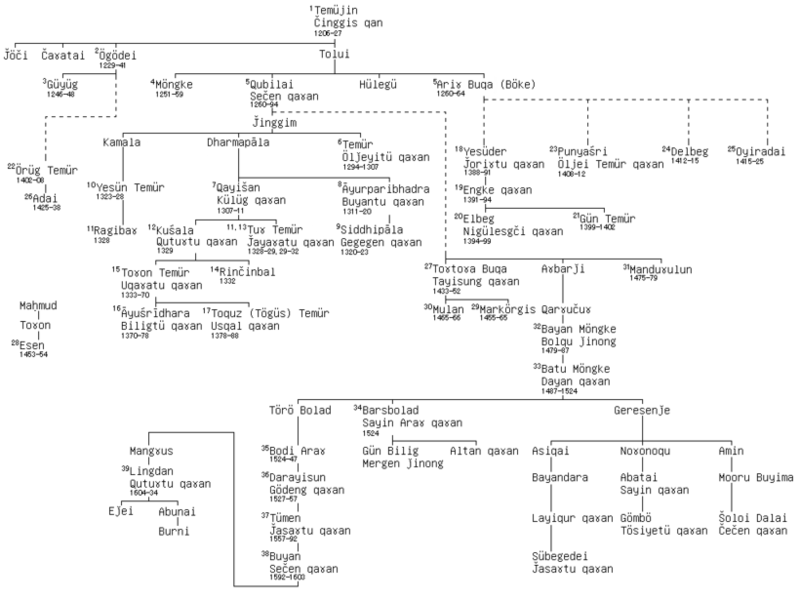 The Borjigin family ruled over the Mongol Empire from the 13th to 14th century. The rise of Genghis (Chingis) narrowed the scope of the Borjigid-Kiyad clans sharply. This separation was emphasized by the intermarriage of Genghis's descendants with the Barlas, Baarin, Manghud and other branches of the original Borjigid. In the western regions of the Empire, the Jurkin and perhaps other lineages near to Genghis's lineage used the clan name Kiyad but did not share in the privileges of the Genghisids. The Borjigit clan had once dominated large lands stretching from Java to Iran and from Indo-China to Novgorod. In 1335, with the disintegration of the Ilkhanate in Iran, the first of numerous non-Borjigid-Kiyad dynasties appeared. Established by marriage partners of Genghisids, these included the Suldus Chupanids, Jalayirids in the Middle East, the Barulas dynasties in Chagatai Khanate and India, the Manghud and Onggirat dynasties in the Golden Horde and Central Asia, and the Oirats in western Mongolia. The Qing dynasty respected the Borjigin family and the early emperors married the Hasarid Borjigids of the Khorchin. Even among the pro-Qing Mongols, traces of the alternative tradition survived. Aci Lomi, a banner general, wrote his History of the Borjigid Clan in 1732–35. The 18th century and 19th century Qing nobility was adorned by the descendants of the early Mongol adherents including the Borjigin. The Chingisid principle, or golden lineage, was the rule of inheritance laid down in the (Yassa), the legal code attributed to Genghis Khan. The term Chingisid people was used[by whom?] to describe the people of Genghis Khan's armies who came in contact with Europeans. It applied primarily the Golden Horde, led by Batu Khan, a grandson of Genghis. Members of the Horde were predominantly Oghuz — Turkic-speaking people rather than Mongols. (Although the aristocracy was largely Mongol, Mongols were never more than a small minority in the armies and the lands they conquered.) Europeans often (incorrectly) called the people of the Golden Horde "Tartars". The last ruling monarch of Genghisid ancestry, Maqsud Shah (d. 1930), Khan of Kumul from 1908 to 1930. The Borjigin held power over Mongolia for many centuries (even during Qing period) and only lost power when Communists took control in the 20th century. Aristocratic descent was something to be forgotten in the socialist period. Joseph Stalin's associates executed some 30,000 Mongols including Borjigin nobles in a series of campaigns against their culture and religion. Clan association has lost its practical relevance in the 20th century, but is still considered a matter of honour and pride by many Mongolians. In 1920s the communist regime banned the use of clan names. When the ban was lifted again in 1997, and people were told they had to have surnames, most families had lost knowledge about their clan association. Because of that, a disproportionate number of families registered the most prestigious clan name Borjigin, many of them without historic justification. The label Borjigin is used as a measure of cultural supremacy. In Inner Mongolia, the Borjigid or Kiyad name became the basis for many Chinese surnames adopted by ethnic Inner Mongols. The Inner Mongolian Borjigin Taijis took the surname Bao (鲍, from Borjigid) and in Ordos Qi (奇, Qiyat). A genetic research has proposed that as many as 16 million men from populations as far apart as Hazaras in the West and Hezhe people to the east may have Borjigid-Kiyad ancestry, but the professionalism of that study is being criticised. The Qiyat clan name is still found among the Kazakhs, Uzbeks and Karakalpaks. Empress Xiaoduanwen (Jerjer) was made empress in 1636, Empress of Emperor Hong Taiji. Daughter of Prince Manjusri. Known as a benevolent empress and the most virtuous of all. Made "Motherly Empress Dowager Empress" (Mu Hou Huang Tai Hou) in 1643 after the death Of Emperor Hong Taiji. She died in 1649 (Shunzhi's 6th year of rule). Empress Dowager Xiaozhuang (Bumbutai) was historically considered the mother of Qing dynasty. She was a concubine of Huang Taiji. Daughter of Prince Jaisang and niece of Empress Xiaoduan. Made the "Enlightened Mother Dowager Empress" (Sheng Mu Huang Tai Hou) in 1643 after the death of Emperor Hong Taiji. She died in 1688 having helped Shunzhi Emperor, her son, run the country till his death and Kangxi Emperor, her grandson, for 25 years of his reign. Xiaozhuang was an excellent politician who did not like to interfere in politics, unlike the notorious Empress Dowager Cixi. However, when the conditions required, she rendered her efforts. Wikimedia Commons has media related to Borjigin. ^ A Middle Mongolian plural-suffix -t has been written about by Éva Csáki in Middle Mongolian Loan Words in Volga Kipchak Languages. ^ Wada Sei [ja] did pioneer work on this field, and Honda Minobu and Okada Hidehiro modified it, using newly discovered Persian (Timurid) records and Mongol chronicles. ^ According to H. H. Howorth, Mamai used the clan name Kiyad which is near to Genghisid lineage. However, he was not direct descendant of Genghis Khan. ^ a b Histoire des campagnes de Gengis Khan, p. 119. ^ a b Histoire des campagnes de Gengis Khan, p. 118. ^ Histoire des campagnes de Gengis Khan, pp. 118, 123. ^ Histoire des campagnes de Gengis Khan, pp. 122-123. ^ a b Humphrey & Sneath, p. 27. ^ The Secret History of the Mongols, chapter 1, §§ 17, 21. ^ Franke, Twitchett & Fairbank, p. 330. ^ a b Atwood, p. 45. ^ Heirman & Bumbacher, p. 395. ^ Humphrey & Sneath, p. 28. ^ "In Search of Sacred Names". ^ "The Genetic Legacy of the Mongols", pp. 717-721. Atwood, C. P. Encyclopedia of Mongolia and the Mongol Empire. Crossley, Pamela Kyle. A Translucent Mirror. Franke, Herbert; Twitchett, Denis; Fairbank, John King. The Cambridge History of China: Alien Regimes and Border States, 907-1368. "The Genetic Legacy of the Mongols". American Journal of Human Genetics, 72. Halperin, Charles J. (1985). Russia and the Golden Horde: The Mongol Impact on Medieval Russian History. Indiana University Press. ISBN 0-253-20445-3. ISBN 978-0-253-20445-5. Heirman, Ann; Bumbacher, Stephan Peter. The Spread of Buddhism. Histoire des campagnes de Gengis Khan (in French). E. J. Brill. Humphrey, Caroline; Sneath, David. The End of Nomadism?. "In Search of Sacred Names", Mongolia Today, archived from the original on 2007-06-07 . Kahn, Paul. The Secret History of the Mongols. Li, Gertraude Roth. Manchu: A Textbook for Reading Documents. Magnier, Mark (October 23, 2004). "Identity Issues in Mongolia". Los Angeles Times. Pegg, Carole. Mongolian Music, Dance & Oral Narrative. Perdue, Peter C. China Marches West. Sneath, David. Changing Inner Mongolia: Pastoral Mongolian Society and the Chinese State. Weatherford, Jack. Genghis Khan and the Making of the Modern World. Three Rivers Press.